In the My PS … series of blog entries this entry lists the SnapIns and Modules I use (regularly). Note that the following list is my personal list and that it is definitely not my aim to list all available PowerShell snapins and modules. That would be a sheer impossible task, seen the abundance of the currently available snapins and modules. In a recent PowerCLI Community thread someone asked how he could create Alarms with the current PowerCLI build. Since there is no PowerCLI cmdlet (yet) to create Alarms I had to fall back on the CreateAlarm method from the SDK. The procedure as described in the vSphere Web Services SDK Programming Guide, chapter 15, is quite simple. The script I wrote created the alarm, but to my amazement I couldn’t use the Edit Settings option in the vSphere client. The option was grayed out. One of the interesting new features in vSPhere is vStorage Thin Provisioning. I’m not going to explain what Thin Provisioning is all about. For that you can consult several knowledgeable blogs (for example this entry on Virtual Geek) and/or books (for example Scott Lowe’s excellent Mastering VMware vSphere 4.0). The problem I have with Thin Provisioning, is that there are a lot of existing guests and templates out there that were created with Thick VMDKs in the past. The only documented way I could find to convert these Thick VMDKs to Thin VMDKs was to use svMotion from the vSphere client. An interesting question arrived in my mailbox recently. The user was trying to find out how he could assign a vCenter license. The vSphere API Reference clearly pointed to the UpdateAssignedLicense method. But the value that should be provided in the entity parameter was a bit of a mystery. An entity ID for a vCenter was new for me. Over the last few weeks I have published a number of blog entries that showed how you could use PowerShell, PowerCLI and the SDK to automate the management of the vNetwork Distributed Switch. To facilitate the use of the functions I provided in these posts I created a table that lists all the dvSwitch related functions together with a link to the post where they were published. The double Service Consoles and vmKernel connection might look confusing at first. 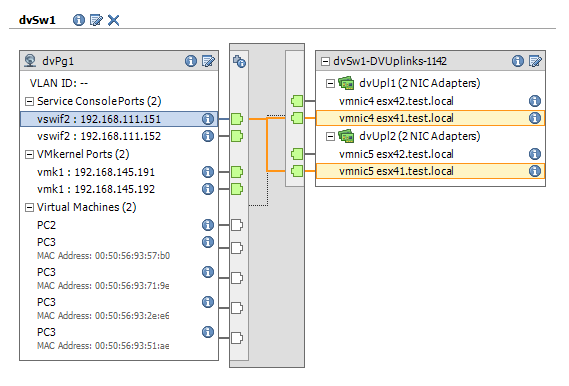 But when you select one these connections, the vSphere client will show you to which uplink a specific connection is going. In the previous dvSwitch posts (see Part1 & Part2) I created a dvSwitch with a dvPortgroup, and we migrated some guests to this dvSwitch . In this part I’ll show you how to create Service Console and vmKernel portgroups over the dvSwitch. Again, all the shown scripts will do a minimal configuration of the new portgroups. More advanced configurations will be discussed in future posts in the dvSwitch series. This is the schematic view of the configuration that we currently have. 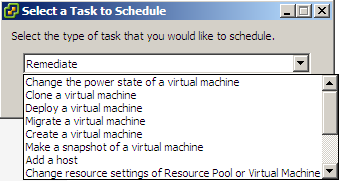 With the introduction of vSPhere the types of Tasks you can select when you create a new Scheduled Task has increased. This is a very useful feature that allows you to schedule for example your (s)vMotions, your Snapshots, your Imports and Exports and so on. In the PowerCLI Community there was a recent question on how these Scheduled Tasks can be created from PowerShell (see relocate vm’s from csv file and create schedule task in VC). In Part 1 of the dvSwitch scripting series I created a simple dvSwitch with 2 uplinks, which I connected to all the ESX hosts that were returned as possible candidates. In this part I will show you how to add a dvPortgroups and how you can connect Virtual Machines to this dvPortgroup. This is the schematic of what we have so far. With the introduction of vSphere one of the new features that was introduced was the vNetwork Distributed Switch. This new type of switch offers many more features than the “classical” vSwitch we knew. In the current PowerCLI build there are no cmdlets present to create, configure, manage and remove this new type of switch. Surely this will change in one of the upcoming PowerCLI releases.